I normally blog on a Monday, but I’ve made an exception today, because I’ve been seduced by the offer of a free book. It’s Self Printed Edition Three, by Catherine Ryan Howard, self-publishing guru. My claim to fame is that I chaired a panel she was taking part in during Waterford Writer’s Weekend 2013. She asked people to send her a question and to post her answer on Friday October 24th, to get my free copy. I hope the question and answer will prove useful to anyone who’s self publishing. Here’s my question. There’s also some info about the book, and how you can get hold of it. I have Self Printed Mark Two, but apparently the third edition is completely different, so it’s worth investing in even if you’ve read previous versions. Q. What are your options if you want to hire someone to format your book? You have three options for hiring formatters. The first is an editor – because yes, some editors also do formatting. So you could put some tweets or e-mails out into the universe and see if anyone has a personal recommend for a freelance editor who also does e-book formatting. The second is to go to Mark’s List which is available on Smashwords (Mark being the Smashwords founder). This is a list of cheap and cheerful e-book formatters who, generally for an hourly rate, will do your formatting for you. The third option is what I do: I go to eBookPartnership. They are based in the UK and they take care of everything – formatting and distribution. And they don’t just format: they make an e-book for you, so if you have bullet points or images, leave them in there! And, as luck would have it, they’ve given me a conversion package to give away worth $299! Stop by my blog today or over the weekend to enter for your chance to win. Catherine Ryan Howard is a writer, self-publisher and caffeine enthusiast from Cork, Ireland. SELF-PRINTED: THE SANE PERSON’S GUIDE TO SELF-PUBLISHING (3rd edition) is out now in paperback and e-book and available from Amazon. Follow the #selfprintedsplash on Twitter today (Friday 24th) and/or visit www.catherineryanhoward.com for a chance to win an amazing prize that will get your self-publishing adventure started! 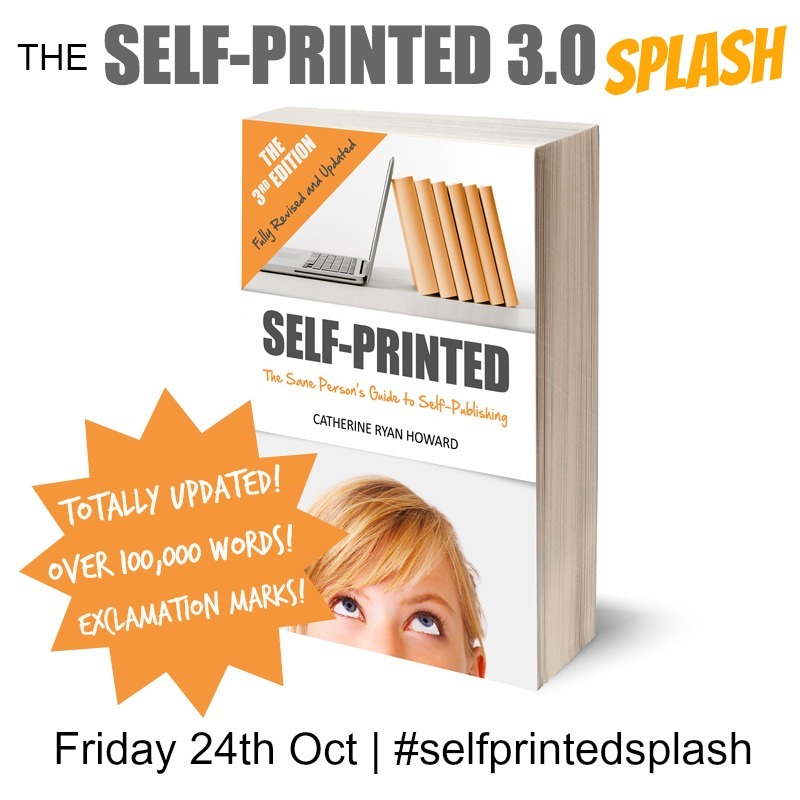 Self Printed by Catherine Ryan Howard, Making a Splash. If I were a proper writer, I would … write when I rose in the morning, with last night’s dew still clinging to the grass. I don’t do that because … even though I’m a morning person, I need my morning energy to do grunt work like email pitches, dealing with bureaucracy and ideas for workshops and ways to, you know, make money. But then again … there is no perfect time of day to write. You just have to make the most of the pockets of time that appear in even the busiest day. If the only time I have in the day to write is when I’m on the bus into town, then that’s when I’ll write. If I were a proper writer, I would … write in a book-lined room. I certainly do get my best writing done in my writing room. But then again … I get a perverse pleasure from writing on the road: in cafes, in banks and on buses, creating a bubble of silence for myself in the midst of chaos. You can’t wait until you’ve found a hallowed spot to write. Create your own bubble and start writing. If I were a proper writer, I would … thrive on my own company, rather than the company of others. I don’t do that because … the isolation would drive me mad. That’s why I’m out at least two nights a week. But then again … mixing with other people offers fertile soil for new ideas to thrive, as I’m stimulated by banter and the ebb and flow of ideas, washed down with wine, coffee and vice laden food. The idea that only a certain environment or writing process will lead to writing success is a myth. There’s no right way to write. There’s just your way. What writing myths do you subscribe to? And what myths have you busted?